Developing a lesson plan for origami folding is not difficult. While elaborate dragons and complicated floral bouquets are best left to adult paper folders, even an elementary school child can be taught to master simple origami designs. Origami for kids is a popular craft because it's inexpensive and requires no special tools. All you need is paper, patience, and imagination! Wrapping paper is a good choice for working with children on their first origami projects. It is easy to fold and adds a bit of color to your designs. However, you will want to take the time to make sure you have your sheets cut to size before you begin your lesson plan for origami folding. Generally, it's a good idea to stick to projects that have five or six steps when you're teaching children about origami. Young children are notorious for their short attention spans. Longer projects will be more difficult for them to follow and increase the odds of unnecessary frustration. If possible, it may be a good idea to fold several different versions of your origami model so the children can see what their project should look like after each step. 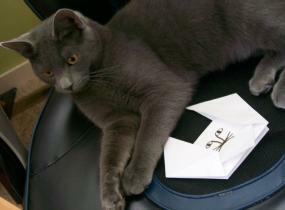 However, you will want to take the time to point out that origami requires a bit of practice. Children need to understand that it's normal if their model doesn't turn out quite right on the first try. If you're interested in books that feature origami projects for children, the Easy Origami for Kids slideshow has several title recommendations. Origami lessons can incorporate a variety of concepts, depending upon the age of the child and the exact project you are making. Directions for origami projects are often written with the assumption that the reader understands certain terminology, such as book fold, mountain fold, and valley fold. You can find an explanation of the most common origami folds by reviewing the Origami Folding Instructions slideshow. Experienced origami folders generally don't measure their paper when folding it into fractions. However, having a ruler handy might be a good way to assist children who are just getting started. Add google eyes to an animal. Add glitter to an origami photo frame. Choose watercolor patterned papers to make a realistic looking origami flower. Decorate an origami box with stickers. 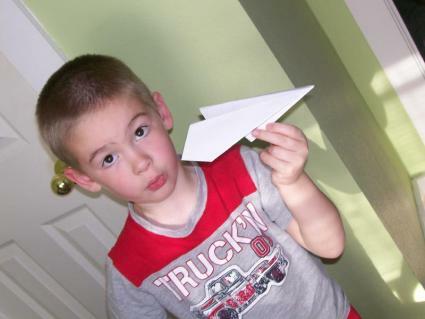 Children may also enjoy making origami models to use as props for skits or role-playing games. For example, simple origami weapons make good props for a child pretending to be a cowboy, a pirate, or a police officer. Many elementary school classrooms incorporate origami projects into lessons about the importance of recycling in protecting the planet. Turning items that would otherwise be thrown away into fun and useful objects provides kids with a great sense of accomplishment. Make party hats from old newspapers. Use magazine pages to make boxes to hold small gifts. Fold an origami cone from an old paper grocery bag to use as a treat holder. Make paper flowers to use as party decorations.